Podcasting is a relatively new phenomenon that has been spreading the globe from around 2003. 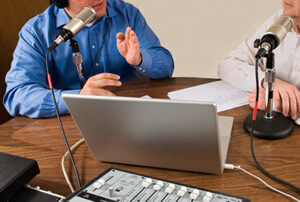 Podcasting is simply the act of producing and distributing a Podcast via the world wide web. Rather than being a fad or a trend, Podcasting has become a significant communication and marketing tool for many companies. Podcast is a term derived from Apple’s iPod (first introduced in October 2001). In reality, a Podcast is just an mp3 audio file that is distributed on demand via the internet. A Podcast can be listened to straight from the internet or downloaded to any mp3 player – not just an iPod! Possibly the greatest appeal of the Podcast is that it can be listened to at the convenience of the listener with many making use of commuting time. The subject of a Podcast can be almost anything, however, Podcasts are generally in a series and enable the listener to subscribe using an RSS feed (really simple syndication) This is a real advantage for businesses as not only does your first Podcast mention your business name and its activity but it reminds your audience when a new Podcast is available, hence reinforcing your company message and identity. Common Podcast subjects can be anything from product information delivery, help files, news reports, sports information, hobbies, comedy, tutorials, debates, interviews, company training, internal company communication, seminar recordings, client testimonials etc. The key for using Podcasts effectively as a business tool is to find a subject that your target market will find useful. You are trying to get a group of regular listeners and therefore should avoid making your Podcast a blatant advert for your services. If you provide your listener with useful content and information that is relevant to them and their industry they will happily subscribe to your Podcast. Furthermore, popular Podcasts spread more readily over the internet giving your company lots of cost effective advertising and PR. Your Podcasts should ideally be in the form of a themed series with each Podcast episode being anywhere from 5-30 minutes in length. Having a planned format will help keep your program flowing and varied. It is a good idea to consider making your content as timeless as possible; after all, your Podcast will potentially be around forever. Encouraging feedback and suggestions from your audience can help steer the programme into a direction that listeners want. Popular features can be interviews, “how to” guides (without giving your trade secrets away), informational content, mentioning useful industry resources, talk shows, industry news, reviews etc. There are no set rules for Podcast content so don’t be afraid to use your imagination. Trying something new or different can make you unique and stand out from others. Anyone with a PC and a microphone can record a Podcast, however, creating a professional sounding Podcast production is a different matter. If you want your company to project professionalism then you need to use one of the growing numbers of Podcast producers. Your company’s sonic branding should be taken as seriously as your visual forms of branding. As mentioned previously, your Podcast could be around forever in cyberspace; therefore it is worth investing a little time and money into getting it right. Remember, your Podcast has the potential to be a powerful PR and marketing channel for your business. Excessive background noise, mobile phone interference, bad microphone placement, ramblings on with long silences should have no place in your company Podcast.